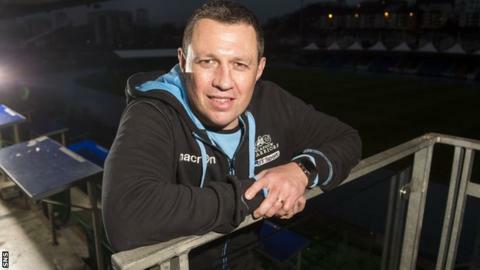 Glasgow Warriors' Champions Cup chances will not be disrupted by Saturday's tie against Racing 92 being postponed, says assistant coach Matt Taylor. The match in Paris was called off after the attacks in the French city. Warriors will now open their campaign at home to Northampton Saints, who defeated Scarlets 15-11 in their first match of the competition on Saturday. "From the way we have trained and the meetings we've had, we are now focused on our rugby competition," said Taylor. The Warriors coach acknowledged it had been a difficult time emotionally for the players and said they had sympathy for those directly affected. "We'll reflect away from our sporting activities, maybe at night, but the guys have been really professional and they are really focused," said Taylor. "It was one of the best training sessions I've been involved with since my time here and hopefully that transfers into a good performance on Saturday." Taylor said that it was beneficial that Northampton play a similar style of rugby to Racing. "On the Saturday, we had a training run because we didn't have the game and we prepared a few things we want to do against Northampton," he said. "Both teams are reasonably similar, so it was quite good going into this game that a lot of the things we prepared for Racing are similar to Northampton. "A lot of the preparation for Saturday should help us reasonably well for this week even though we didn't have a game." When Glasgow will be required to return to Paris to face Racing has yet to be decided. "It is quite difficult as there are three competitions to work out the timings," said Taylor. "But we will just turn up when they tell us to." Glasgow have secured two victories in the Pro12 since their squad was bolstered by players returning from the Rugby World Cup finals. Taylor admitted that personnel changes disrupt any side, but he said: "We are starting to get into our rhythm. "I feel it is beginning to gel and I've got a really good feeling about this weekend."